Trevor Haworth, Master Mariner and founder of Captain Cook Cruises passed away on 1st March 2014, aged 82. His life was one of pioneering vision, great courage, adventure and achievement in building the iconic business Captain Cook Cruises, and helping to shape the Tourism Industry in Australia. He was a man of high moral principles with true Christian ethics. Trevor was a committed supporter of many charitable works including Rotary and is survived by his wife Geraldine, three loving children Jackie, Anthony and Allison and 7 grandchildren. Trevor Haworth was born in Blackburn Lancashire on June 8, 1931, the son of a Naval Deck Officer, Frank Haworth and mother Gladys. At the age of 6, Trevor was orphaned after his mother and father both passed away. After briefly living with his maternal aunt Cissy, in Scotland, Trevor returned in 1939 to Blackburn to live with his Grandparents, Richard and Bertha at their house 'Isca' near Preston. From here, Trevor attended Hutton Grammar School as a boarder throughout World War 2 just as his father had, throughout World War 1. During a return to 'Isca' during school holidays, his grandfather spoke to Trevor about his future. Richard was aging. He had a successful art dealership, but knew there was insufficient time to teach Trevor the business. Trevor elected to follow his father's footsteps and gained a place at HMS Conway in 1946, a boarding ship-school for educating and preparing cadets for command in the Royal and Merchant Navies. He entered Conway in 1946. It was a disciplined, tough maritime school where boys joined at 14 and a half, and 2 years later graduated as Cadet Officers trained for command and ready to sail the world. Trevor graduated in late 1947, and soon after accepted a position as a cadet with the South American Saint Line Ltd. Here he worked for 6 years, rising to third mate, delivering cargo and coal to all parts of the world from the Persian Gulf to South America. It was aboard these ships working with crew largely from the north of Scotland; hard working, hard drinking, physical, tough men, that Trevor learnt his seamanship craft. It was an ideal training ground that Trevor often recalled. He summarised its import through the words of Laurence Holt the Chairman of Blue Star Line, he too an old Conway boy; "One does not need to be an academic to command a ship; what one needs is strength of character and common sense". Trevor lived his life through these words. Despite the offer of a promising career with the South American Saint Line, Trevor elected to move to Australia. In 1954, he stepped ashore in Townsville, from a small sugar lighter, with a one way air ticket to Sydney and a letter from Australian Customs to say he could stay as long as he liked. In 1955 Trevor joined the Swire and Yuill group a part of the Australian Oriental Line, operating between Australia, Japan and Hong Kong, where he stayed for the next 6 years, rising to master of the SS Taiping in 1960 at the age of 29. He was the youngest Master the company had ever appointed. In 1959 on a blind date in Sydney, Trevor met Geraldine Coates. She was the love of his life and they were to make a great team in love and in business. They married in 1961. Years earlier Trevor had decided to go ashore when he married. He became a partner in a Marine Surveying company with Captain Michael Downs. Two children soon followed; Jackie and Anthony. Trevor was not enjoying surveying and purchased a Marina at Northbridge where he repaired, moored and sold vessels. It was here that he also started a round the world ship delivery business 'Ocean and Coastal Deliveries' with an intrepid sailor, master navigator Peter Mounsey. On a trip to the UK Trevor stopped off in New York. It was there, on a 'Circle Line' cruise of Manhattan, that Trevor formed the idea of starting a similar business in Sydney. About a year later his youngest daughter Allison was born. As fate would have it, on his return to Sydney he was asked by the owner of an old ex-navy 'Fairmile' if he could start a sightseeing cruise business on Sydney Harbour. Trevor realised this was going to be a long process and offered to bare boat charter the vessel on a five yearly basis. A deal was struck and Captain Cook Cruises Sydney Harbour was born on Australia Day 1970. Trevor knew location was everything and so approached the relevant authorities to operate from Circular Quay. Initially rejected, dogged persistence paid off and the business was granted a berth at the end of the quay at Jetty 6, away from Government operations, from which it still operates today. Captain Cook Cruises found the going tough and did not make a profit in the first few years. It survived where others failed because Trevor and Geraldine understood the importance of marketing, were able to subsidise the cruise operation from the profitable marina business, and because they didn't do too much too soon. By starting with only two cruises a week, costs could be contained. From the start the focus of the business was international tourists. To maximise this market, Trevor devoted enormous time and effort to the promotion of Australia. Trevor was a pioneer of Australian tourism. Over 40 years, he was involved in numerous committees and tourism Boards; Vice Chairman Sydney Convention and Visitors Bureau; Chairman and Vice Chairman Inbound Tourism Organisation of Australia; Commissioner Australian Tourism Commission; Commissioner NSW Tourism Commission; Deputy Chairman Australian Tourism Industry Association; Life Member Pacific Asia Travel Association and board member of the Australian Institute of Company Directors. For his contribution to Tourism he received many awards, including the Australian Tourism Award for Outstanding Contribution by an Individual in 1994 and was awarded Member of the Order of Australia on the 5th of June, 1985. 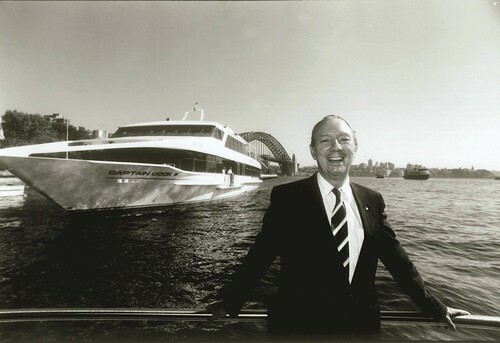 With the growth of Tourism to Australia, hard work and a commitment to re-investment, Trevor and Geraldine built the business on Sydney Harbour from only one boat with two cruises a week to 30 departures a day, building a fleet of 12 restaurant & sightseeing vessels culminating in the construction of the 68-metre, 700-passenger flagship MV Sydney 2000 in 1999. But it wasn't all smooth sailing. In 1975 Trevor contracted endocarditis, necessitating a lifesaving heart valve replacement. And then just 2 years later in Hong Kong Trevor was almost killed in a car accident where his taxi driver died and Trevor was hospitalised for 4 weeks. Apart from the personal health challenges Trevor had to navigate stormy waters many times during the company's history. In the '90s, both Amalgamated Holdings and Accor bought into the Sydney cruise market. Despite the greater financial and marketing power of the multinationals, Captain Cook Cruises managed to continue to grow and prosper, seeing Accor sell out of the Industry in 2003 and buying the Amalgamated business 'Matilda Cruises' in 2005. Success in Sydney allowed the business to look for other opportunities. Trevor expanded the business onto the Murray River, and then was approached to go into partnership with Qantas in an accommodated cruise on the Great Barrier Reef. With the purchase of a cruise business in Fiji 1997 the business was growing into what became positioned as the leading small ship cruise line of Australia and the Pacific. At its peak, the Captain Cook Cruises group included over 25 ships in four destinations and carried over one million passengers per year on sightseeing and dining cruises and over 40,000 passengers on overnight cruises. Fiji became Trevor's passion. He loved the islands, the people and the culture. Trevor continued to invest in the Fijian business through 3 military coups, subsidizing significant losses with an unyielding belief in the magic of the product. Trevor was also a tireless supporter of Rotary. He was a founding member of the Sydney Cove Rotary Group in 1978 and made available the use of the company's vessels every Friday morning at Jetty 6 Circular Quay for the club to meet. For his contribution, Trevor was recognised by Rotary with the Awarding of the Paul Harris Fellowship medal. He was also a Trustee of the Lizard Island Research Foundation. In July 2008, Captain Cook Cruises provided the official fleet of vessels for the Papal Boatacade on Sydney Harbour, as part of World Youth Day. The Captain Cook flagship MV Sydney 2000 was selected as the lead ship to carry Pope Benedict XVI from Rose Bay to the Official Papal welcome at Barangaroo. Trevor considered this moment the pinnacle of his business career. In 2011 Trevor sold the Sydney and Murray River operations of Captain Cook Cruises to the Sealink Travel Group. The Haworth family still owns and operates the successful Fijian operation of Captain Cook Cruises with 5 vessels and an island today. Trevor is survived by his wife Geraldine, daughters Jackie Charlton and Allison Haworth West and son Anthony. He has seven grandchildren - Ben, Emily, Patrick, Scott, Anna, Lucy and Edward.